While Michigan is home to a lot of solid Americana, plenty of Mom-and-apple-pie sorts of attractions-including no small amount of apple pie-that's no reason to think that the state doesn't pack in its share of the offbeat and unusual too. For those who want a walk that's a little more on the wild side, Michigan has plenty of unfathomable weirdness afoot. So buckle up, pack a lunch and a flare gun, and brace yourselves for some of the most unusual sights, and sites, that Michigan has to offer. Perhaps unfortunately named, Colon has a particular advantage in the weird department as it's home to some of the greatest magic on the face of the earth. Dubbed the Magic Capital of the World, Colon is currently home to the resting place of Harry Blackstone Sr., and another set of over 30 magicians, the Lakeside Cemetery. It's also home to a fairly major magical industry, including the Abbott Magic Company, Sterlini Magic Manufacturing, and FAB Magic, making it possible to not only see the history of magic, but also its future. Out at the Meijer Gardens, there's a bronze horse that measures 24 feet tall. Dubbed "The American Horse" and sculpted by one of the biggest names in animal sculpture Nina Akamu, it's based around a similar work from legendary artist Leonardo da Vinci. The American Horse is actually half of a two-part set, as a second horse made from the same cast is currently seen in Milan, Italy. Thus the horse seen in Michigan is about the same as the one seen in Milan. Most know that Michigan has islands in its many lakes. What most don't know about, however, is the bizarre natural grandeur of a place called Turnip Rock. 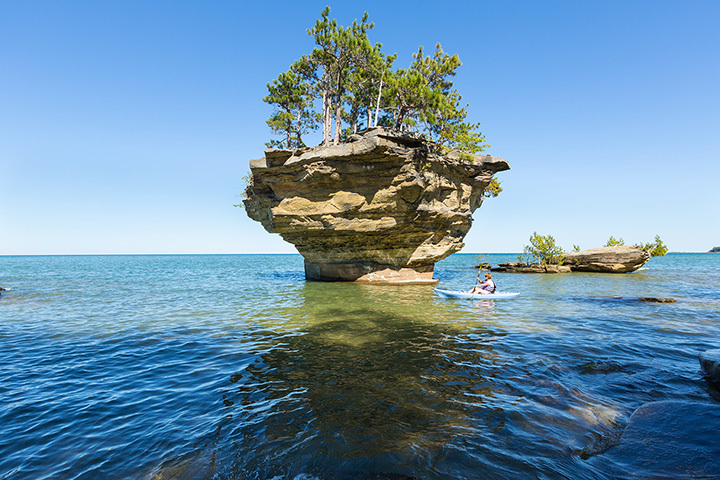 Near Port Austin, and named for its obvious turnip-esque profile, this bizarre wonder rises up out of the surface of Lake Huron almost like an island from the film "Avatar." It's privately owned-and therefore not immediately accessible to the public-but it's also well-known to area residents as a prime destination for kayakers. Scattered throughout the city of Ann Arbor are a series of small doors, a kind of widespread art installation known as the Fairy Doors. The doors have been known to switch locations, from time to time, and appear at various locations. Seven of the original doors are said to still be visible, and another 10 have stepped in since. A "goblin door" is also on hand, and these doors each contain different things to see once opened. Some door sites even offer a guestbook for viewers to leave reflections, and some visitors are known to leave things behind "for the fairies." Perhaps the closest thing to a horror movie setting that Michigan has, Turtle Island is actually in two states simultaneously: Michigan and Ohio. The island is home to a slate of abandoned buildings, including what's left of the Turtle Island Light, a lighthouse built back in 1866. The island is closed to the public, but given its remote nature and dual-state location, enforcement has proven impossible. The island features some of the most eerie scenery around, including a set of abandoned vacation homes. This space was once utilized as a jazz dancehall in the 1920s, but became a hub for rock music in the 60s. Now, it sits rotting away in Detroit with no sounds left to offer but the spooky creaks and silence of the abandoned halls. The ballroom officially closed in 1972, which led to fixtures being looted from the venue and ceilings crumbling. But curious thrill junkies still enjoy exploring the deserted spot. Home of the Northern Michigan Wildcats, the Superior Dome has one wildly unusual quality to it: it's the single largest wooden dome on the planet. This architectural anomaly is noteworthy enough in itself but that's not all the Superior Dome has to offer. Complete with retractable turf, the Dome offers three basketball courts, volleyball and tennis courts, and even facilities for banquets, conferences, and trade shows. Head to Pontiac for one amazing haunted house. In 2005, it was named a Guinness Book of World Records record holder as the "World's Largest Walk-Through Haunted Attraction." It retained that record until 2009. A four-story nightmare rising up out of Pontiac like a dark idol of horror, the attraction may be seasonal, but it's just too big to not notice. Of all the things that could be said about the Upper Peninsula, "a marked shortage of chainsaws" is probably not on the list. Even if no one in the region owned one, which is outlandish given its heavily rural nature, the chainsaw known as Big Gus would probably make up the average sufficient to give most everyone at least a little chainsaw. Big Gus, part of Da Yoopers Tourist Trap, is the world's largest working chainsaw, measuring 23 feet in length and powered by a V-8 engine. While at the Trap, check out Big Ernie, a massive and fully-functional lever-action rifle-it once fired a duct tape-wrapped rock 2.5 miles into a cornfield-mounted on a truck. In Potterville lurks a restaurant devoted to one of the strangest foods around: chicken gizzards. A family business for generations, featured on Food Network mainstay "Diners, Drive-Ins and Dives," and known for the flavor of their gizzard batter, Joe's Gizzard City may be the only such gizzard-focused enterprise around. For those less adventurous, meanwhile, have access to standard chicken dinners along with burgers and even battered onion rings. Every weekday at dusk-along with Fridays and Saturdays in May and September-from Memorial Day and running through Labor Day, the Grand Haven Musical Fountain offers a show in lights, sound, and moving water. Each show runs 25 minutes, and features songs from Lee Greenwood's "God Bless the USA" to "Hedwig's Theme" from the Harry Potter movies. While perhaps not as active-or as frequently seen-as the Bellagio's fountains in Las Vegas, but for a version potentially closer to home, the Grand Haven Musical Fountain will show what Michigan's greatest resource, water, can do. Perhaps one of Michigan's best-known jokes, the town of Hell isn't a common destination but there's still plenty to see. A popular destination for Halloween, and the focal point of an entire line of merchandise, Hell offers "sinfully delicious ice cream," the chance to be mayor for the day for the low price of $100, and the general ability to say that you've been to Hell and back. Do you like jerky? Do you like pretty much nothing but jerky, with maybe a side of sausage? Then there's great news ahead thanks to Dundee's Jerky Outlet. The Jerky Outlet makes jerky out of meat from a wide variety of animals-ever had elk jerky? How about venison? How about...buffalo? Try one, try many, but they're all at the Jerky Outlet. A 50s diner only means so much by itself, but it's not the food alone you'll want to come out here for. No, between the burgers, pizzas and similar material found at Dawson & Steven's Classic 50s Diner in Grayling, you'll want to have a look at the Bottle Cap Museum, which contains the single largest privately-owned collection of Coca-Cola memorabilia in Michigan. With over 10,000 individual pieces of memorabilia to see, it'll take a good while to go through it all. So start with lunch at the diner, and by the time you've cleared the museum, it might be time for dinner. Coincidence? Or planned that way? The name says it all. In Three Oaks, there's a huge-if you consider 11 feet long huge, which for a kaleidoscope might well qualify-kaleidoscope on a telescope mounting in the town. This isn't some mockup or vague representation, either.as the name notes, the kaleidoscope works, and every bit as well as its smaller versions. Seize one of the wheel spokes near the viewing end, spin it, and watch the series of colored panels provide its own breed of visual experience. Built in 2012 for the Grand Rapids ArtPrize competition, the kaleidoscope took up permanent residence in Three Oaks back in 2013. That's 15 great and bizarre attractions waiting for you out in Michigan. From giant chainsaws to stores devoted wholly to preserved meat and just about everything in between, even some entire towns are bizarre enough to be considered bizarre attractions. There's lots more waiting for you, so pack up, head on out, and discover some of Michigan's weirder side!